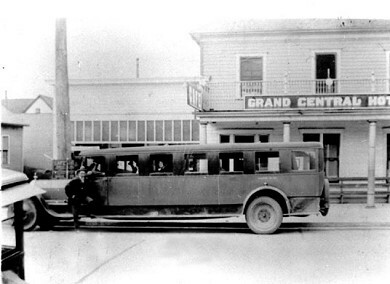 One of the forerunners to a Metro Bus is parked in front of the Grand Central Hotel in this circa 1930 photo. The stage, as it was called then, appears to hold about 14 or 15 passengers and, at the time of this photo, is awaiting passengers. The Issaquah Press advertises on September 16, 1931, that hotel rooms are 75 cents and up, with weekly rates ranging from $ 2 to $ 3. Mrs. M. Z. Marion is proprietress of the hotel, and Ratchford & Kennedy are proprietors of the cafe, which advertises a dinner at 40 cents.